The highly anticipated e-drum kit has finally arrived but does it distinguish itself? Lots of good quality factory sounds. Impressive kit feel. Ability to load your own sounds. Eye-catching design. Doesn't quite offer the limitless sonic possibilities some were expecting. We're a big fan of the DrumIt Five's bold, distinctive design. The DrumIt Five module is a simple-looking device, but hosts a lot of impressive sounds. USB connectivity and 4Gb of flash memory add real flexibility. The combination of orange and brushed metal gives the kit something of a vaguely 'original iMac' feel about the surfaces. 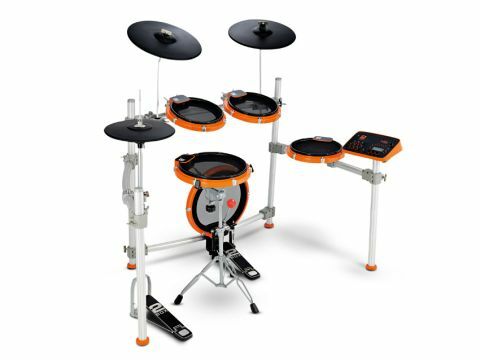 Has there been a more eagerly awaited electronic drum kit than 2Box's DrumIt Five? We can't think of one. Of course, many of us look forward to new additions to the Roland, Yamaha, etc line-ups, but the buzz around 2Box in the last couple of years has been on a different level. Internet chatter and speculation led to high expectations for what sections of the e-drum community had convinced themselves would be a revolutionary game-changer of a set-up. "Given 2Box's trumpeting of the DrumIt Five's 'open sound nature', we were half expecting the kit to be a little lacking in terms of factory sounds. How wrong we were." Much of the excitement surrounding the DrumIt Five is down to its (self) description as an 'open-sound drum system'. 2Box has designed the kit to enable users to employ whichever heads they prefer - regular or mesh heads will work - and to create and import their own sounds into the DrumIt Five module too. It's a tempting proposition, the chance to really customise a kit to your own peculiar requirements and away from what everyone else is using. The physical design of the DrumIt Five sets it apart from the crowd too. There's something vaguely 'original iMac' about the combination of orange and brushed metal surfaces - not that everyone approves. We absolutely love it and see no reason why the default colour for such things should be black (other than it's what sells because musicians, as a species, are so remarkably conservative), but opinion is definitely divided if internet banter is anything to go by. However, there's nothing to complain about as far as pad construction is concerned. A cast aluminium chassis provides a solid base for the pads, which feature tensionable heads and a nicely low-profile aesthetic in the same ballpark as Korg's Wavedrum and Yamaha's DTXtreme III pads. We're quite comfortable playing an electronic kit that doesn't try and ape the visuals of an acoustic set, so were pleased that 2Box has had the courage to come up with something as character-laden as the DrumIt Five. In terms of triggering, the drum pads feature a main head sensor and independent rim trigger to allow for either realistic acoustic emulations, where rimshots or crossstick sounds are very much part of the deal, or for separate sounds to be assigned to head and rim. Some won't be even remotely interested in triggering a conga sound on the head and a 909-style sub-kick on the rim, others will lap up the sonic opportunities. Cymbals are multi-zone as well, allowing sounds to be coaxed from edge, bow and bell in as natural a fashion as possible. The cymbal surfaces are enveloped in silicon rubber, which 2Box amusingly refers to as offering "a feel close to the real thing". Rubber gives a response not a lot like bronze in our book, but these do feel good thanks to their well-judged 'give' when struck. The pads are easy on the wrist, but provide enough resistance to each stroke as to feel like you're playing an instrument, not poking a toy. 2Box also pursues the 'real feel' with a hi-hat mounted on a regular hi-hat stand. It's a single pad as opposed to the two-pad set-up of Roland's nice-but-pricey V12 hi-hat, but it retains a good degree of tactile response once calibrated to your own playing style. The fact that the snare pad mounts on a stand and the bass pad is a sizeable 14-inch also contribute to an impressively usable kit feel. The DrumIt Five brain is a strikingly simple-looking device. Given that we're used to seeing flashy LCD screens with big data wheels (and even mini mixers on top-level gear) from the big manufacturers these days, the DrumIt Five might at first seem a bit underwhelming. But call to mind other quirky Scandinavian musical tools like Nord's Lead synth or the Elektron SPS1 drum machine and suddenly it looks confidently understated rather than underfeatured. The brain comes loaded with 100 factory kits, a selection of playalong tracks, USB input for connecting to Mac or PC, MIDI in and out and 4Gb of flash memory - in short, it acquits itself nicely, despite its uncluttered front panel. Given 2Box's trumpeting of the DrumIt Five's 'open sound nature' (ie: the ability to import your choice of sounds, or even create your own from WAV, REX or AIFF files with the company's own editing software), we were half expecting the kit to be a little lacking in terms of factory sounds. How wrong we were. While the potential to get into this degree of personalisation is welcome, it's absolutely not necessary in order to start really enjoying the DrumIt Five. Perhaps the fact that the unit comes from a small outfit and not one of the big corporations threw us off a bit, but the degree of dynamic response and quality of the multi-sampled preset acoustic kits thoroughly impressed and surprised. With not-terribly-obscure names that allude to Chilis, Foo Fighters and Zeppelin songs here and there, the acoustic emulations are warm, deep and involving. Cymbal response is lovely, with the move from defined bow 'ting' through to a crashing wash of edge tone on the ride handled near seamlessly; toms also deliver a three-dimensional and pleasingly organic dynamic tone. Should the desire exist to create or install your own sounds (and having heard the default sounds we reckon a good chunk of DrumIt Five customers might limit their delving into such areas given the quality of what's already available), you can do so from the above-mentioned file types. Some online discussion has centred around being able to stuff the DrumIt Five with sounds from your favourite VST (BFD, Superior Drummer, Addictive Drums etc) - aside from the legalities of doing so, those that employ proprietary file types won't allow a drag-and-drop approach. So don't get too carried away that the DrumIt Five offers sonic solutions without limits, for the moment at least. Such was the level of expectation surrounding the DrumIt Five that some might be resistant to the opinion that it's not, in fact, the answer to every last question you'll have of an electronic drum kit. But it is really good, and a very interesting addition to the marketplace. Different in character to offerings from the big boys, it's rewarding from the box, and will allow creative players scope to design sounds that are unique to their kit. Doing so might not be obstacle-free or effortless, but the fact that the opportunity exists is a good thing. If the promised support in terms of OS updates and editing improvements materialises in time, 2Box will convincingly establish itself as a force to be reckoned with.